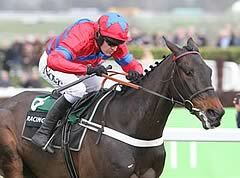 When Sprinter Sacre could finish only second in the corresponding race 12 months ago there were calls for his retirement, but in what has been one of the greatest training performances of Nicky Henderson's career he has been brought back to something approaching his incredible best of three years ago. Sent off the 11-10 favourite to confirm his superiority over Champion Chase runner-up Un De Sceaux, his task was made easier by the several jolting errors his main market rival made. As Sire De Grugy looked to hassle Un De Sceaux all the way, the latter's jumping fell apart, but all the while Nico de Boinville crept closer on Sprinter Sacre. Yet another blunder at the Pond fence by Un De Sceaux handed Sprinter Sacre the initiative and he just pulled further clear up the hill to win by 15 lengths from Willie Mullins' Un De Sceaux with Dodging Bullets third for Paul Nicholls. De Boinville said: "It was wonderful today, we got a lovely tow into the race, he was nice and settled. 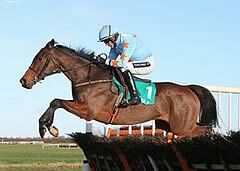 "We knew he was very fresh and well, his schooling was unbelievable. We always do what is right by him but he told us he wanted to run today. "The guv'nor has worked miracles to get him back. "The triumph, the turmoil has been unbelievable." Henderson said: "That was why we had to run, he loves doing this, if you look at that you can see why we have to do it. "We have to enjoy him and he's enjoying himself, we've got to let him show what he can do. "There were moments we thought it was all over but we were never under any pressure. "It's been a long journey but this season has been amazing, he's great for the racing game, I hope, he's good for me but my old heart might not take much more of it." Mullins said: "He lost a shoe but I'm not making excuses, he just didn't jump with his usual fluency."